"Boom!" "Bip!" You may remember these optical interjections popping-up during the fist fights on the '60s Batman television series. With this in mind, know that turntablist Boom Bip (born Bryan Hollon) couldn't have chosen a better stage name. Boom Bip is a musician who creates the beats and loops essential to Hip Hop, and explosively punctuates them with his own or a guest's instrumental performances. The late '90s found him releasing an EP (The Low End Sequence EP, a collaboration with local DJ Osiris) and various singles compiled on independent Mush Records (a division of Dirty Loop Music). But Mush released Boom Bip's most colorful punch last year with his first full-length, Circle. This collaboration with rapper Doesone is an ambitious, avant Hip Hop novel that must be heard to be believed. 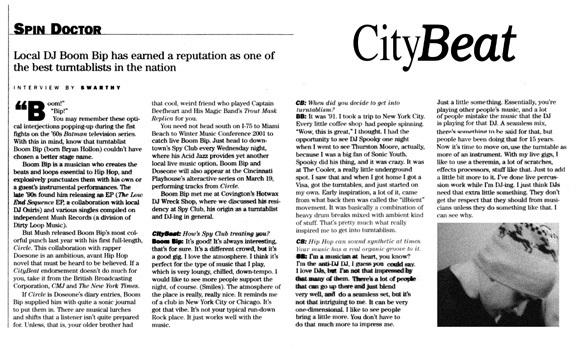 If a CityBeat endorsement doesn't do much for you, take it from the British Broadcasting Corporation, CMJ and The New York Times. If Circle is Doseone's diary entries, Boom Bip supplied him with quite a sonic journal to put them in. There are musical lurches and shifts that a listener isn't quite prepared for. Unless, that is, your older brother had that cool, weird friend who played Captain Beefheart and His Magic Band's Trout Mask Replica for you. You need not head south on I-75 to Miami Beach to Winter Music Conference 2001 to catch live Boom Bip. Just head to downtown's Spy Club every Wednesday night. Boom Bip and Doseone will also appear at the Cincinnati Playhouse's on March 19, performing tracks from Circle. Boom Bip met me at Covington's Hotwax DJ Wreck Shop, where we discussed his residency at Spy Club, his origin as a turntablist and DJ-ing in general. CityBeat: How's Spy Club treating you? Boom Bip: It's good! It's always interesting, that's for sure. It's a different crowd, but it's a good gig. I love the atmosphere. I think it's perfect for the type of music that I play, which is very loungy, chilled, down-tempo. I would like to see more people support the night, of course. (Smiles). The atmosphere of the place is really, really nice. It reminds me of a club in New York City or Chicago. It's got that vibe. It's not your typical run-down Rock place. It just works well with the music. CB: When did you decide to get into turntablism? BB: It was '91. I took a trip to New York City. Every little coffee shop, bagel shop, whatever, had people spinning. "Wow, this is great," I thought. I had the opportunity to see DJ Spooky one night when I went to see Thurston Moore, actually, because I was a big fan of Sonic Youth. Spooky did his thing, and it was crazy. It was at The Cooler, a really little underground spot. I saw that and when I got home I got a Visa, got the turntables, and just started on my own. Early inspiration, a lot of it, came from what back then was called the "illbient" movement. It was basically a combination of heavy drum breaks mixed with ambient kind of stuff. That's pretty much what really inspired me to get into turntablism. CB: Hip Hop can sound synthetic at times. Your music has a real organic groove to it. BB: I'm a musician at heart, you know? I'm the anti-DJ DJ, I guess you could say. I love DJs, but I'm not that impressed by that many of them. There's a lot of people that can go up there and just blend very well, and do a seamless set, but it's not that intriguing to me. It can be very one-dimensional. I like to see people bring a little more. You don't have to do that much more to impress me. Just a little something. Essentially, you're playing other people's music, and a lot of people mistake the music that the DJ is playing for that DJ. A seamless mix, there's something to be said for that, but ... people have been doing that for 15 years. Now it's time to move on, and use the turntable as more of an instrument. With my live gigs, I like to use a theremin, a lot of scratches, effects processors, stuff like that. Just to add a little bit more to it. I've done live percussion work while I'm DJ-ing. I just think DJs need that extra little something. They don't get the respect that they should from musicians unless they do something like that. I can see why.